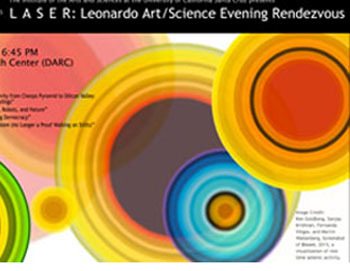 The Leonardo Art/Science Evening Rendezvous (LASER) is a national program of evening gatherings that brings together artists, scientists, and scholars for informal presentations and conversations. John Weber, founding director of the Institute, noted that the main themes of the event--such as "why art and science" and "why now"--will provide context to show how the new series will serve as a local forum for presenting art and science projects underway throughout the University of California, in the Bay Area, and beyond. Titled Exploring the Frontiers of Knowledge and Imagination, the October 8 event will take place at UCSC’s Digital Arts and Research Center (DARC) in Room 108, beginning at 6:45 p.m.
• Ken Goldberg—professor of New Media at UC Berkeley, where he and his students investigate robotics, art, and social media. Topic: “Sensitivity Analysis: Arts, Robots, and Nature." “Leonardo is a long-established, international organization devoted to furthering dialogue and work in the arts and sciences, and our talks will be publicized both regionally and nationally through their network,” said Weber. Weber added that future LASER events at UCSC will deliberately mix speakers from on and off campus and will feature work from a variety of different fields. “We are inviting some speakers working in areas we are particularly interested in, such as health and water, and we are also paying attention to fields that UCSC is particularly strong in, such as astronomy, said Weber. Future LASER events at UCSC are scheduled for November, 5, January 28, February 25, April 8, and May 6. Speakers TBA. This event is presented by UCSC's Institute of the Arts and Sciences and the Division of the Arts. For more information, contact the Institute at ias@ucsc.edu.